Maybe you’ve faced it before – a new house with an empty room or two. This room is just crying out for some furniture. So off you go to purchase a sofa you admire - then a chair. Or perhaps you purchase a full living room set complete with tables and rugs. With delivery a few weeks off you can just picture your living room (and not surprisingly, it looks just like the showroom). The delivery day arrives and you can’t wait to cut the tags off of your new furnishings. You may have to position the sofa a few times to get it just so, but all in all, you’re pretty satisfied – until you notice there’s no art on the wall. And so you decide to buy some art that matches the sofa. I cringe a little while I write this, but in reality that is how many of us choose art. In fact, little confession, I still have art in my house that I bought because the frames matched! If you have also considered buying art in an afterthought, you’re not alone. We have all been taught that accessories finish off a room. In fact, if you’ve ever watched a design show, you’ll notice that some professional designers decide on the art once fabric, furniture and rugs have been selected. So maybe we’ve all been brainwashed to believe that filling our space with art doesn’t require much planning – just the ability to carry a swatch of fabric to a store. Well, just for a moment, I’d like you to think about your art and why you might acquire it sooner rather than later. Art inspires creativity. First choose art that appeals to you, and then let your furniture and accessory purchases be influenced by the art you have selected. This shift in viewpoint allows for freedom of expression. Through the process of seeking out new art, and finding something you’d like to live with, you open your mind to all the new possibilities. Perhaps an abstract piece of art inspires you to consider an eclectic collection of furniture instead of a uniform suite. Maybe art with cool beach tones allows you to consider that slip covered furniture with a nautical appeal. Or a tropical print encourages you to use a hand-painted floorcloth in vivid hues in your new artistically inspired room. Consider also the structural elements in your room. Many living areas have unique architectural details that historically have been used to display important art. By only focusing on furniture placement or accessorizing, you may lose sight of some of your home’s great details. If the architectural details are not what they once were, before you rip it out, liven it up. Apply a mosaic design or faux finish to your fireplace surround. When you’re thinking about changing things break out of the familiar and experiment with your creativity. For some creative inspiration, find the nearest child. Generally, young children are much more free to express themselves than some adults, and when it comes to design, I can say from experience that they’ll have their own unique opinions on what goes in their rooms. 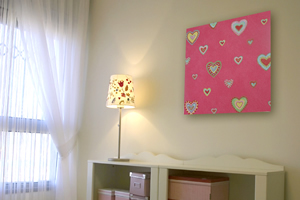 Take a cue from your child’s artwork when you design their rooms. This way they are more inclined to love it when you’re done. 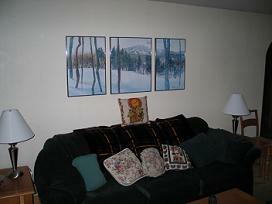 Gather together several of their favorite paintings or sketches, and note their favorite color, or emerging themes. You can copy these same themes through painted fabric, a wall mural, unique stained glass for the window, a floorcloth or even a quilted wall hanging. Don’t forget to frame and hang the original artwork that inspired their new design. So set out to design your living spaces with art as forethought. You will appreciate the art for what it adds to the overall project as well as the positive feeling you experience when you see it. And then you may begin to wonder why you ever tried to buy art that matches that pillow with the odd purple color. Happy art collecting!